UPDATE—FRAZIER PARK, PINE MOUNTAIN CLUB, LEBEC, GORMAN, CA (Sunday, July 31, 2018 at 2 a.m.)—A fire erupted in the Valle de Oro section of Santa Clarita just west of Sierra Highway about 4 p.m. Monday, July 30. It started as a brush fire in a steep canyon area. The blaze rushed uphill toward an apartment/condo complex at the top of the ridge. Reports say that embers blew into vents, starting fires inside the multifamily dwellings. 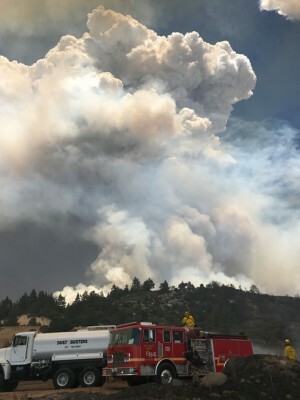 Traffic on Sierra Highway was backed up for several miles near the burn area as residents tried to leave the area all at once, local reports say. The blaze, called the Railroad fire, was 85% contained by 10:30 p.m. Helicopters made water drops while firefighters on the ground defended homes with fire hoses. No residents were injured, but three firefighters were taken to the hospital for minor injuries (one for smoke inhalation, two for minor burns). Tweeted reports from Los Angeles County Fire Department during the night said 10 acres were burned. 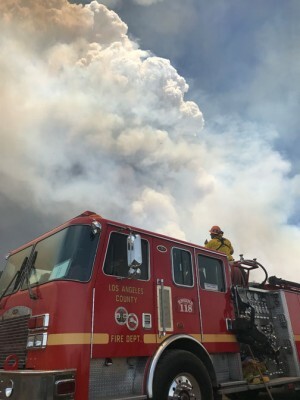 PREPARE: The L.A. County Fire Department also tweeted out advisories to residents to be prepared to evacuate: When a brush fire is burning nearby, keep the 6 Ps ready in case an evacuation is required. UPDATE—FRAZIER PARK, PINE MOUNTAIN CLUB, LEBEC, GORMAN, CA (Sunday, July 29, 2018 at 4 p.m.)— The Carr fire around Whiskeytown Lake east of Redding has now claimed six lives, authorities report. The fire is at 89,000 acres and is less than 5% controlled. 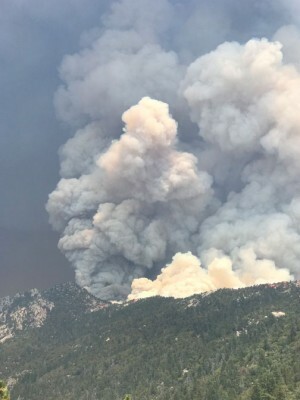 Meanwhile, the Ferguson fire, near Yosemite, is continuing to burn. Haze has returned today to local skies. Be cautious about any kind of outdoor exertion when air quality is this bad. UPDATE—FRAZIER PARK, PINE MOUNTAIN CLUB, LEBEC, GORMAN, CA (Saturday, July 28, 2018 at 8:30 p.m.)—A shift in wind has cleared the skies over the Mountain Communities today, and made breathing less hazardous outdoors. But deadly fires are continuing to burn throughout the state. Three more people have died in the Carr fire near Redding, a great-grandmother and two small children. Two firefighters have also died. The Riverside fires continue to burn and the Ferguson fire continues to threaten Yosemite. Governor Brown declared a State of Emergency in Lake, Mendocino and Napa Counties due to fires. This is the state press release. UPDATE—FRAZIER PARK, PINE MOUNTAIN CLUB, LEBEC, GORMAN, CA (Friday, July 27, 2018 at 2:50 p.m.)—An alleged arsonist has been arrested for starting nine fires in Riverside County, according to a report just issued by The Los Angeles Times. Brandon N. McGlover, 32 has been charged with 15 felony counts related to the fire. The town of Idyllwild was evacuated yesterday. 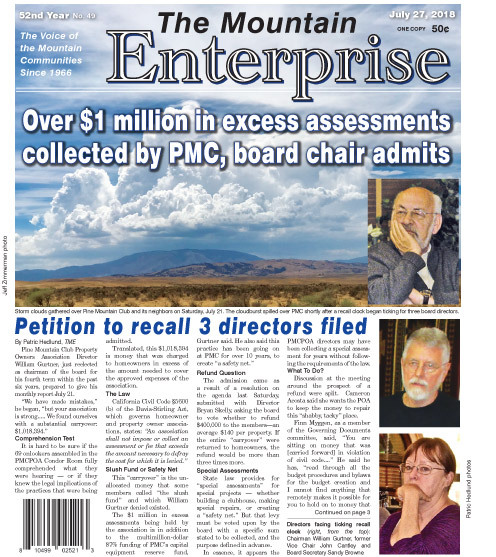 The editor of The Idyllwild Cryer, emailing from a motel, wrote The Mountain Enterprise: “We were given one hour to get out.” They were fleeing the Cranston fire that has burned “more than 11,500 acres.” The Times reported McGlover is being held on $1 million bail. Thousands are said to have had to leave their homes. UPDATE—FRAZIER PARK, PINE MOUNTAIN CLUB, LEBEC, GORMAN, CA (Thursday, July 26, 2018 at 2:50 p.m.)—The haze in the skies over the Mountain Communities this week is said to be coming from the Ferguson fire to the north which is threatening Yosemite. For safety here on the mountain: be cautious and alert. Do not use power tools that cause sparks in the heat of the day. Be rigorously cautious about cigarettes. Outdoor fires are prohibited in the forest except in designated areas. Target practice in the forest is prohibited. At home, be sure your property is surrounded by “defensible space,” cleared of hazards and free of ladder fuels and items that could catch fire from flying embers. This is a dangerous time throughout the state. FRAZIER PARK, CA (Tuesday, July 24, 2018 at 8:45 p.m.)—The smoky air around the Mountain Communities is not due to a local fire. According to the Kern County Public Information Office, the only active fire in Kern County right now is in the Lake Isabella area, and they are not aware of any fire burning in the forest surrounding our area. This leaves only the likelihood of drift-smoke coming from distant fires, possibly such as the Ferguson fire near Yosemite.